Black Friday and Cyber Monday 2017 deals have started to show up on some Chinese e-retailers website, so as every year, I’ll go through a non-exhaustive list with the most popular websites. GearBest’s 2017 Black Friday event offers discount from 8% up to 15% for mobile phone, tablets & computers, and appliances. 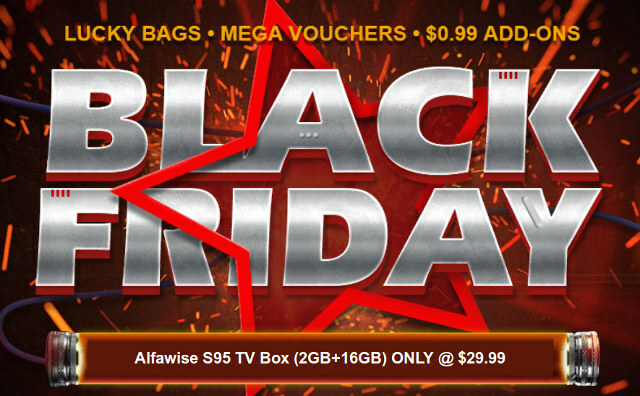 One example if Alfawise S95 TV Box with S905W/2GB RAM/16GB flash going for $29.99 shipped. They also offer coupons up to 20% or a just amount in dollars. You can purchase lucky bags with a surprise product, some flash sales will be organized, as well as a lucky draw to win Xiaomi Mi 6 smartphone. Aliexpress is ready for both Black Friday and Cyber Monday with some games to win coupons, and deals per category. I have not found any specific yet, but while the games are on, the actual Black Friday sale will only take place between November 24 and 26, and Cyber Monday on 27-28. GeekBuying’s Black Friday Sale will take place between November 22-29, with coupon from 8 to 20% for various category of products, or even specific products such as Yi M1 camera.Flash deals will also be launched at low price, but as usual with very low quantity – as on all sites for this type of offer – so you’ll have to be right on time to benefit from the offers. DX Thanksgiving Sale has started and will run until November 27. $3 and $6 coupons are up for grab, and a Xiaomi Mi Mix 2 smartphone will be offered to one lucky winner. They have discount for various categories and products, and I did not see any specific deals for products I’ve familiar with. I’ve come across a $25 (not 3D printed) Nintendo NES case for Raspberry Pi which can be interesting to some people. 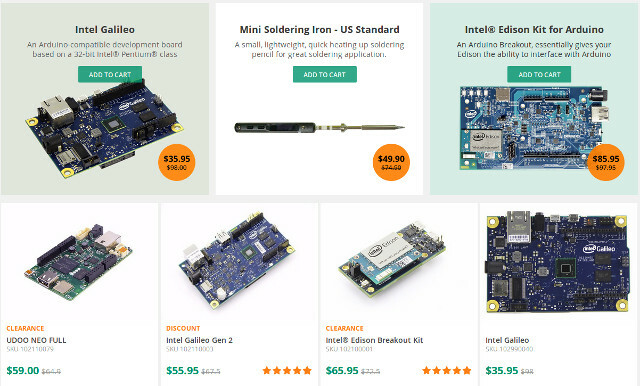 If you’d like a piece of dying tech / history, SeeedStudio has a Thanksgiving sale with Intel Galileo ($35.95 – out of stock) and Intel Edison ($85.95) kits, as well as other DIY electronics such as UDOO NEO board ($59 going to $32.45 during the flash sales). The company also offers free shipping (excluding Fedex and DHL) for any order above $99 during their Thanksgiving promotion, until November 28. For users in the US, PocketBeagle board is apparently (I’m blocked) sold for $19.99 on Micro Center website. I’ll add further Black Friday and Cyber Monday deals as I find / receive them in the comments section. Offer Valid 11/27/2017 12:00AM-11:59PM PST. Limit one per customer. Limit one coupon per order. Valid until supply runs out. Offer Valid on 11/27/2017 12:00AM-11:59PM PST. Limit one per customer. Limit one coupon per order. Valid until supply runs out. Available for FedEx Ground shipping to US only. With a lucky draw to win an iPhone X (1x), MP3 player, sports Bt headphones, and power bank. Any European sources with discount for the PocketBeagle board? That means you could buy Raspberry Pi (1) Model B+ for around $17.50 for example. Discounts for phones, drones, and stock clearance of various items. Last time I ordered an Inforce board, the customs went in the way, I had to pay 50% of the price in custom fees, no thank you. That’s often a problem with Western sellers, they use couriers, and report the actual item type or price, unlike Chinese counterparts. 10 to 20% discounts for ESP32, LoRa, NB-IoT, etc.. boards and modules, even OEM modules. Lightinthebox super sale @ https://www.lightinthebox.com/promotions/super-sale.html with up to $100 in coupons. Exagear Black Friday Sale with 25% OFF for all products – https://eltechs.com/black-friday-2017. It will last until December 6th.